How to save money on Banjo tools and accessories. What is the first thing you do when you purchase a new or used banjo? Besides play it a lot? The first two things I want to know are is the banjo adjusted so it plays perfectly and do I have the right tools and accessories (picks, straps, stands, tuners, capos, etc.)? I just bought a used Goodtime open back banjo. This is ironic because less than a year and half ago I gave the Silvertone 5-string banjo I had owned since high school to my son who had always admired the instrument. I’m trying to downsize my instrument collection but I’m having a difficult time since I seem to be buying as many instruments as I sell. There was nothing wrong with the Silvertone banjo other than I never played it. In fact, at one point in the past twenty years I had taken the Silvertone to a shop and had the head and tailpiece replaced and the instrument setup. But ever since the death of Pete Seeger I’ve been regretting I never really tried to learn any banjo styles. I applied my finger style guitar skills to the banjo and maybe did a few clumsy attempts at Scruggs style rolls but I never really understood clawhammer banjo. Since then I’ve been slightly obsessed with learning clawhammer banjo. My new banjo was setup fairly well — if anything the action was a bit too low. The head sounded good but needed some modest tightening. Banjo mute. Probably the most important accessory I worried about was a mute. Banjos are loud and I’ve been told practicing them can be irritating to others (my wife told me this). I’m a beginner and don’t want to disturb my wife as I practice my clawhammer “bum dit-ty” (aka ‘boom chick-a’, aka “claw ham-mer”). Something to dampen the noise seems a very good idea. Banjo straps. They’re needed if you will play standing but can make the banjo more comfortable even if you’re sitting. Arm rest. I’ve notice many old time open back banjos don’t have armrests. If you have a frailing scoop and play over the neck, the rim might not cut into your arm so much. However, it is very uncomfortable to play for long periods with your forearm resting across the tension hoop and J-hooks. An armrest would be most welcome. Capo & Tuner. A capo is not essential for playing alone but if you wanted to practice along with youtube videos played in open A for fiddle or with other musicians then you would need a capo or you could just retune the banjo. Unless you have 5th string spikes or a 5th string capo you will still have to retune the 5th string when the other four are raised in pitch with your capo. A tuner is always a worthwhile accessory. Picks. Most clawhammer players don’t use picks even though all say you can. I used to keep the nails on my picking fingers longer than they are now for guitar. But they broke so often I finally realized I didn’t need much nail and played guitar mostly with the flesh of my fingers. My nail length is so short now that it is more difficult to get a good frailing sound (but not impossible). A fingerpick helps. 9/32” banjo head wrench to adjusting the head tension. If you have, or ever might have banjos made by someone else, you might need different sized wrenches. 1/2” open head wrench for adjusting the coordinator rod. This is something many people will already have in their toolkits. I did. Adjusting the coordinator rod changes the neck angle and is a major factor in setting the action (string height). The nut and bridge height and neck relief also affect action but the Goodtime manual and other references indicate the neck angle is the place to start for banjo. Here are my money saving solutions. Note, I don’t claim originality on any of these. The concepts for the strap and the mute have been discussed on forums and blogs. The tools are pretty obvious too. Gold Tone makes a nice banjo mute for about $15 to $20. Deering sells them same mute with Deering name engraved on it. Listening to youtube comparisons it seems a better designed banjo mute is available from Mike’s Banjo Mute. It’s $34.95. I’ve so far made a number of different banjo mutes from scraps I had lying around my house. They all seem to work well and each cost me $0. Among the best of my experimental designs were the simplest. Roll or fold felt, leather, a scrap of cotton (cut for example from an old sock or t-shirt) or simplest of all, a square of facial tissue (Kleenix or your favorite brand). 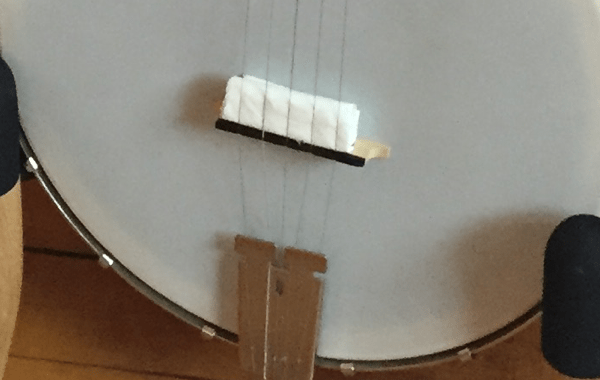 The concept is to put your “mute” between the head of the banjo and the strings — best against the bridge but anywhere between the bridge and neck. You want just enough pressure to muffle the strings but not so much to raise the pitch. You can adjust the volume and tone by rolling the material tighter or moving it closer to the neck. Some of my experiments sounded better than others so if you’re an experimenter, try a few variations. If you’re instead the type that is satisfied with the first thing that works — they all muffled the sound. Left: felt and cotton scraps can be rolled or folded and placed between head and strings for a mute. 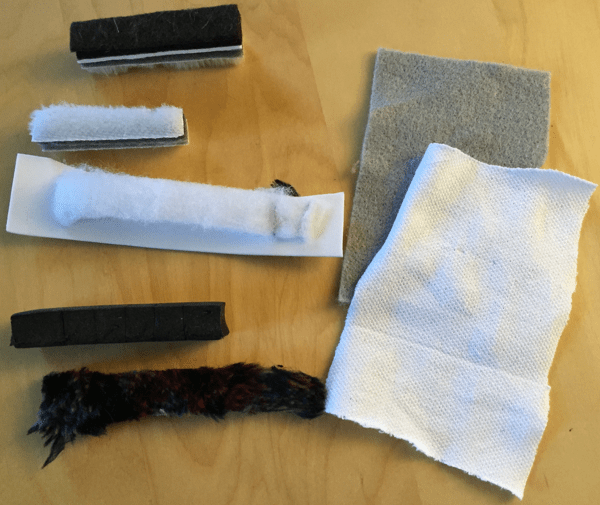 Right from top to bottom: felt; a paint pad cut and stuck to itself (very good sound); synthetic pillow stuffing stapled to foam sheet; stiff foam from packing material cut to fit over the strings; a piece of fake fur. 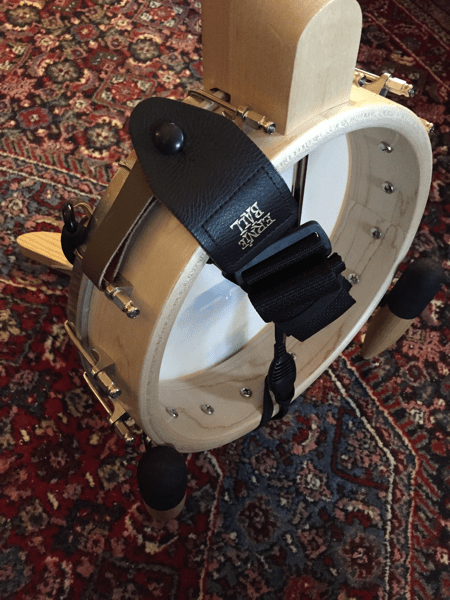 Cradle style banjo straps don’t fit Goodtime banjos. That isn’t a big problem. Goodtime banjos are so light in weight that attaching a strap to the head brackets won’t put a serious strain on them. However, how do you attach the straps then? You can buy special banjo straps with hooks — like luggage hooks. In fact, I’ve used shoulder straps from laptop cases on my old banjo. However another simple solution is to tie a guitar strap onto the brackets using leather laces. You could probably use nylon laces too but the leather looks nicer. Be sure the strap is secured with good knots in the laces. You can also buy banjo strap adapters which look nice and aren’t expensive. But they aren’t free. I happened to have a Martin guitar headstock strap button and a D’Addario Quick-release guitar headstock adapter – neither of which are being used on any of my guitars. I’ve used these on my banjo so I can easily remove the strap. However, I’ve also devised a system where I don’t need to remove the strap when I’m just sitting. I put a velcro cable tie onto the coordinator rod of the banjo — the type of cable tie that allows one end to be snuggly fit to the cable so you don’t use it. When I don’t need the strap I just roll or fold in and then secure it to the coordinator rod with the velcro cable tie . One of my only complaints about my old Silvertone banjo was it lacked an armrest. The tension hoop cuts into my picking arm where it crosses the hoop. I don’t notice this at first but after hours of playing I notice my arm is in pain. I need an armrest. The problem with many of the arm rests available online is they are designed for a banjo with 24 hooks (brackets). My old Silvertone had 12 and the Goodtime has 16. Some models of Goodtime banjos include an arm rest. You can buy a metal arm rest for the Goodtime from Deering and others. But can you make one? I toyed with the idea of making a wooden armrest but ultimately decided I would rather be playing the banjo than experimenting with wood armrests. I’m handy but I’m not a skilled wood worker. I purchased the Goodtime arm rest. Guitar capos work just fine on the banjo. I’ve got several capos. I plan to use the Kyser capo on the banjo. I prefer my Shubb capo for guitar although it fits my banjo too. I never liked the Kyser as much on guitar but it works fine on the banjo. My headstock chromatic tuners of course also fit the banjo just fine. The D’addario micro tuner fits on the rim but doesn’t seem to be as accurate there. I’m using my Snark tuner on the headstock of the banjo. 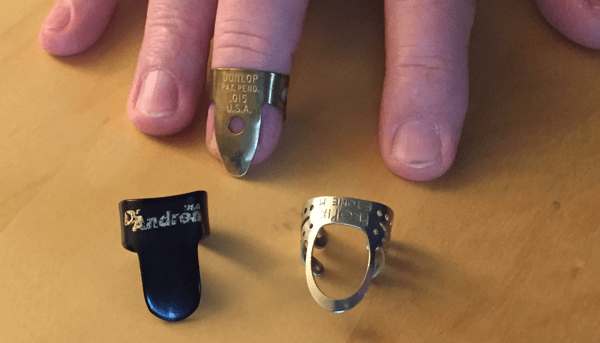 Finger picks are worn reversed from how you would wear them for Scruggs style 3 finger picking or for for guitar. I have a 0.015 gauge Dunlop brass finger pick on my finger. A Finger-tone Pro-Pik is on the right and a D’Andrea plastic pick on the left. All had to be shaped to fit in the reversed orientation. I flattened and reshaped the metal picks with a pliers. Plastic pics have to be shaped after being put in hot water — always a frustrating experience. Banjo Head Wrench (aka head key). 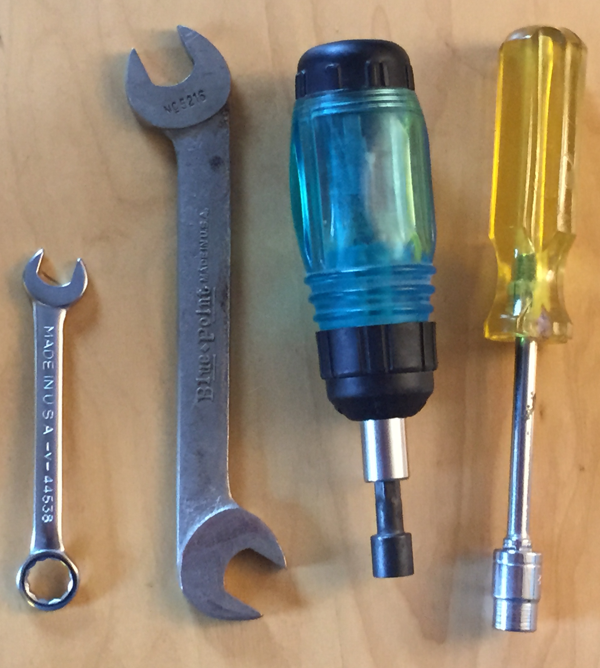 Left to right: combination wrench for tightening the head, in 9/32″ or 1/4 or 5/16″ depending on the banjo; 1/2″ wrench for Goodtime coordinator rod nut; 9/32″ nut driver works on my banjo. It’s held in 1/4″ hex screwdriver head which would adjust some banjos; 9/32 socket on handle. This socket isn’t deep enough to reach the nut on the j-hook but a deep socket would work. I checked my tools to see if I had a 9/32” socket, the size required to tighten the head brackets on a Goodtime banjo. I did but they were not deep enough to reach the nuts. I had a combination open/closed end 9/32” wrench but I seem to have lost it. I might buy another. However, I also had a set of nut drivers designed to go on a power drill. I took the 9/32” driver and put it on a manual handle for 1/4” socket. It was just long enough to turn the nuts. Do not use a power tool for this. You want to turn only about a quarter turn or less for each round. You can but 9/32” deep sockets from Home Depot, Sears or most any other tool store. However if you don’t have one in your house the only reason to buy one instead of the Goodtime or multi-tool wrench designed for this is you can’t wait for the order to be shipped. Other common sizes for the bracket lugs are 5/16” and 1/4”. If you have 1/4” sized nuts you can use any screwdriver with interchangeable bits. Just remove any bit and use the handle. The depth might be too short for this to work with drivers for some magnetic bits. Open head wrench for Coordinator rod. The Deering Goodtime manual indicates the rod size is 5/16” but the nut size requires a 1/2” wrench. If you don’t already have one, they are inexpensive from tool stores. You could also use an adjustable wrench or a half inch socket.